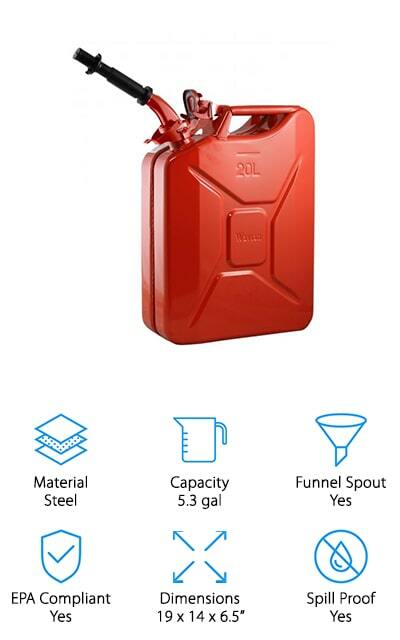 Gas cans are useful when you need to transport fuel or store it for use later. Some cars with smaller gas tanks keep them in the trunk in case they run out of gas on a long trip. We’ve taken a look at some of the best gas cans on the market and narrowed it down to these ten choices. We’ve done all the research for you! But before we get started, here are some things that you need to know! Material: It’s important to know what your gas can is made of so that you know how heavy it’s going to be and whether or not it’s safe to transport. Steel is heavier but often safer than ABS plastic cans. Capacity: The capacity of the can will tell you how much it will carry. It’s important to know how much gas you’re going to need to carry with you so that you can better decide which size can to get. Funnel Spout: A funnel spout will help you pour the gas directly into the gas tank of any vehicle that you need to fuel. 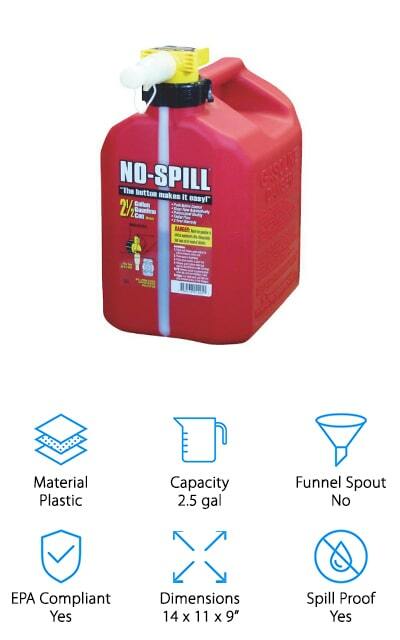 This is a nifty feature that results in fewer spills and less wasted gas. EPA Compliant: The Environmental Protection Agency set up laws for the storage of certain materials. Gas cans must have a specific nozzle or safety measure in place to help protect against leaks and spills for the sake of the environment. 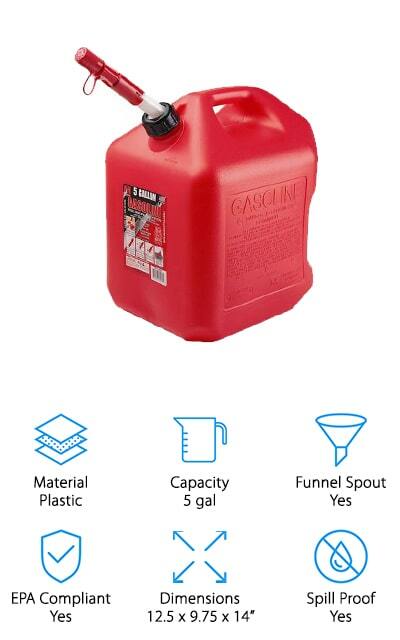 Dimensions: The size of the gas can will tell you if it’s going to fit in your trunk, and it will also tell you how much gas the can is going to hold, for the most part. It’s useful information. Spill Proof: The nozzle of the gas can should prevent gas from spilling all over the place, both when it’s being stored and when you’re pouring it out to use it. You don’t want it to spill out all over your car. Now that you know all there is to know about gas cans, we can show you our gas can reviews. We’ve picked out the best of the best to show you. Our top pick and budget pick are our personal favorites, but the rest of our list is full of amazing gas cans as well, and you should definitely check them out before you make a decision. We’re sure you’ll find a gas can that you love on our list! 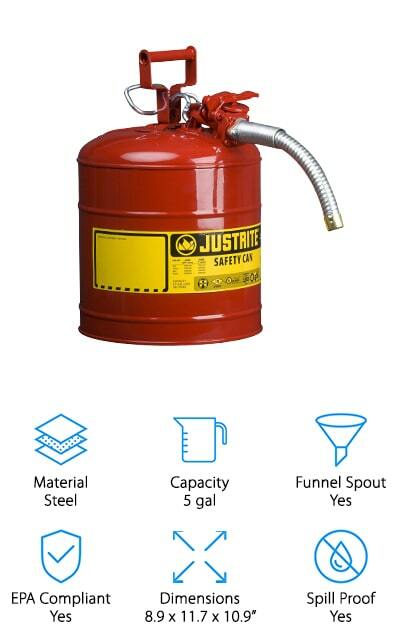 Our pick for the best 5-gallon gas can is this one by Justrite. It’s made of steel, so it’s nice and sturdy. It’s protected against corrosion and the stainless steel that the canister is made of makes it resistant to flame. There’s a large area for labeling the can so that you know exactly what’s in it. It dissipates heat so that flashback ignition is all but eliminated. This protects the gas nozzle and makes sure that it doesn’t ignite, which is a great feature. You can use the trigger on the nozzle to control the flow of the liquid, which is the feature that helps to propel this into our top spot. 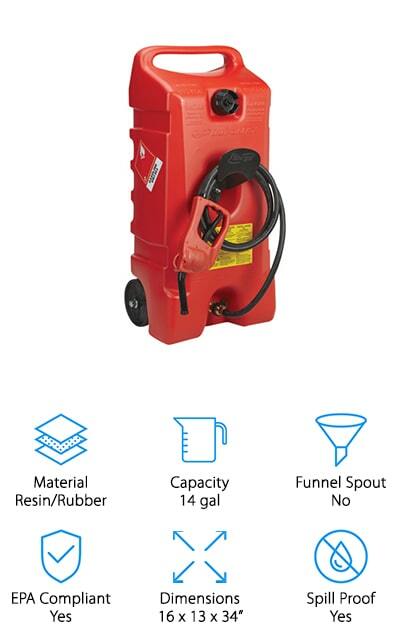 We love that fueling your vehicles and devices can be easier than ever with this pressured nozzle! We also like the self-closing lid that helps to prevent the can from spilling if it’s tipped over, and keeps vapors from making your drive miserable! 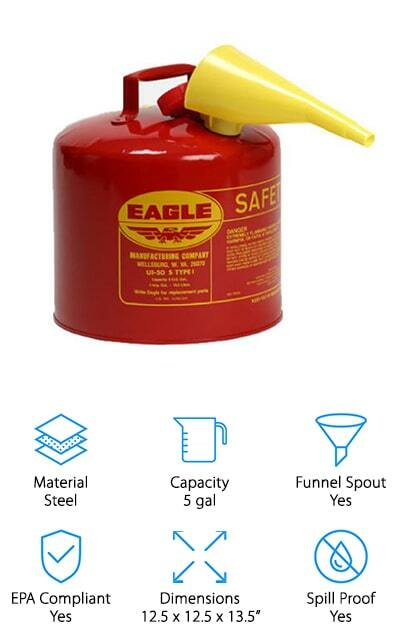 The best gas can for the price is this Eagle Gasoline Can, which is a durable can made of steel. It’s also a five-gallon can, with an attached poly-plastic yellow funnel that you can use to help fuel whatever vehicle you need. It has a flame arrestor screen so that it doesn’t catch fire with the blowback. The trigger release handle is a really good feature for this price so that you can easily fill up your motorcycle or ATV whenever you need to. It fits all safety standards and complies with all the codes that you’d need it to. It’s a galvanized steel construction with a baked on red powder coat that clearly advertises it as a gas can. We love that it comes with a funnel, and all of the seams are double interlocked so there is absolutely no leakage out of this can. The lid also has a gasket that vents pressure from inside! 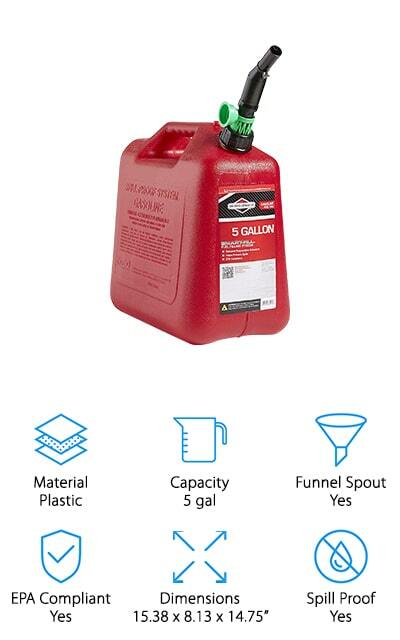 The No-Spill 1405 is one of the best plastic gas cans on our list. It has a funnel spout that can fit into even the smallest gas tanks, so you don’t have to worry about it being too large. It also has a dust cover, so that the spout remains clean and it isn’t contaminated by dust and other materials. It includes a stainless steel mesh screen that prevents the gasoline from igniting. One of the things that we like best about the nozzle on this can is the fact that it closes and doesn’t open again until you press the release button. This means that while you’re getting the can into position to fill the car or ATV, it doesn’t spill all over you. Because of this feature, it’s one of the best 2-gallon gas cans on our list. It’s convenient and easy to use, and you’re going to love not spilling everywhere! One of the top-rated gas cans is this Briggs & Stratton 85053. It’s got a smart-fill spout that keeps all fumes and liquids contained until you go through the process to open the nozzle and allow you to pour the fuel. There are illustrated instructions on the container so that you know exactly what to do, as well as online video instructions on how to use it. There’s a complicated Twist-Anchor-Push function to get the gas to come out of the can, which is something that we love and ensures that children will have a hard time getting into it if they happen to find it. Plus, the five gallons of fuel that it holds is perfect for lawn mowers, ATVs, and other medium-to-large gas powered equipment. It’s EPA complaint and CARB compliant as well, and the dust cap that is included with the nozzle keeps the dirt and dust out of your fuel! It doesn’t get much better! The Scepter Flo n’ Go is the largest gas can on our list, as it can hold up to 14 gallons of gas. It’s a plastic gas can, molded with resin and rubber so it’s not permeable and won’t let the gas or the fumes leak out. The pump system is siphon based, so you can control the flow of the fuel. You can stop and start it as you need to so that you can fuel several lawn mowers or other vehicles without spilling a drop. The host is 10 feet long, and there’s a hanger on the can so you can easily store it when you aren’t using it. That’s invaluable. You can use this can with regular gasoline, as well as diesel or kerosene without worrying about corrosion or leakage, so it’s a multipurpose canister! The hand pump is one of its best features and we love that! You’re going to like this can too! This gas can by Midwest Can Blitz is one of the best portable gas cans that we found in our research. There are two different ways to carry this can, including a top handle and a back grip so that it’s easy to transport and pour the fuel out. It’s made of a heavy-duty plastic that won’t corrode or rust, and it’s strong enough that it won’t even get dented if it gets hit hard. It’s good for riding lawn mowers as well as generators and other large equipment that needs fuel to run. It complies with most of the major fuel container requirements, including CARB, and is spill-proof for the most part. We love this cool gas can that’s perfect for ATVs, gas-powered golf carts, and other vehicles. Get your fuel on the go! We also love that it won’t spill due to the special leak-proof cap. That’s really important for keeping your fuel stored safely. The Rotopax RX-2G is one of the best gas can for storage due to the three-layer molding process that the company boasts as one of their best features. The three-layer system lends itself to an extremely low permeability. This includes a plastic barrier material on the inside of the gas can that helps prevent leaks and guard against corrosion. It has thicker walls and a gasket that seals it tightly so that the spout won’t leak or loosen during transport. We love that they are the only EPA and CARB compliant cans that are rotationally molded, so you know that they’re going to be high quality. Venting these cans is important after elevation or temperature changes, but besides that, it takes care of itself. The Rotopax gas can is a perfectly safe can that you’re going to love having in your garage, or in the back of your truck if you need to transport it! The Waivan Fuel Can is a military-grade can make of steel that will keep all of your fuel in the best possible location. It has a quick release nozzle in the bayonet style, and all of these features plus more make it one of the best gas cans on the market right now. Even the best 1-gallon gas cans can’t compare to the comfort and portability that this can provides. It’s approved by the Department of Transportation as well as the Environmental Protection Agency, and it’s approved for CARB as well. We love how remarkably well-engineered this can is. There was a lot of thought that went into creating this storage solution. And on top of that, it also comes in a nifty green color instead of only coming in red. We love the variety that this can offers! 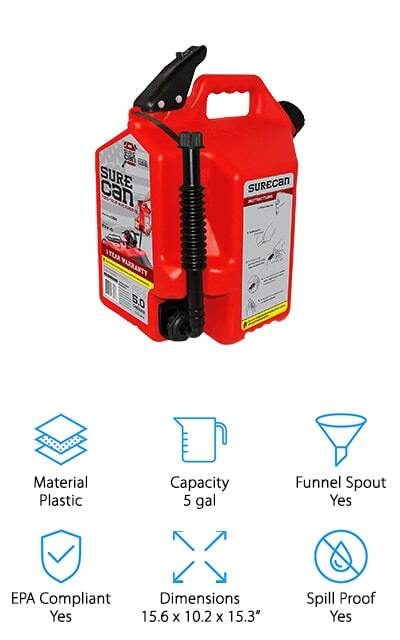 Fuel your gas-powered machines quickly and easily with the use of this can and its easy-pour spout! One of the best ATV gas cans is this Surecan model, and that’s mostly because of a unique feature that we didn’t see very often in our research. Instead of dispensing from the top of the tank like a lot of other gas cans, this can have the opportunity to dispense gas from the bottom of the can. This is made possible by the rotating, bending spout that you can use to connect the two. 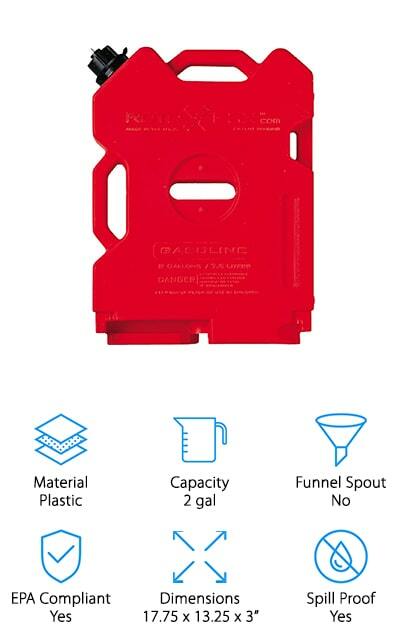 It’s easy to use and helps you fill the receiving tank without any spillage. We love the unique features on this gas tank, with a thumb trigger that helps to vent the contents of the can as well as the ability to see the bottom tank that you’re filling. It’s a convenient tool that we think you’re absolutely going to love! You’ll never use a regular top-pouring gas tank again once you’ve used this amazing bottom-access spout! It’s extremely convenient! The Lovinland 5-gallon tank was made for use over many years, and that’s never more apparent than with the cold-rolled plate structural details. This allows the can to remain durable even after years of use. It comes with an easy-pour spout that is great for automobiles and other vehicles. The spout prevents leaks, but there is an adaptor for some gasoline-powered machines that allows the spout to open when tipped completely over into the pouring position. This allows it to only pour out when it’s specifically set, which makes it really nice for storage. 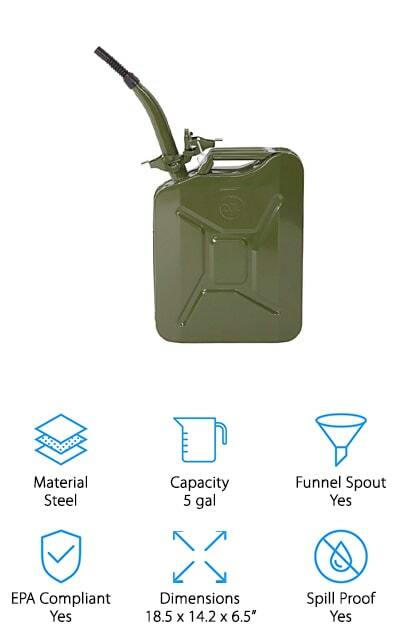 There are so many neat features in this gas can that it’s not surprising that it was able to make our list. And on top of all of that, it comes in a neat military green color as well as the standard red! We love that! Plus, it has three handles which makes it super convenient to carry and store. We know you’ll enjoy it!